Deep dive into the world of Festival Art Sales: Join us for a full day discussing the ins and outs of selling artwork in a festival or street fair environment. Workshop includes a panel discussion and mock jury lead by regional event leaders from the Best of the Northwest, Pike Place Market, Phinney Winter Festival and Shoreline Arts Festival. Learn how to define yourself as an artist and identify your core customers, and use that awareness to drive your marketing decisions. Target festivals that can best showcase your work and develop effective jury application materials. Discover critical techniques to create a professional mini-storefront imbued with your style, and learn how to engage customers to maximize show sales and have the best possible festival experience. Observe a Mock Jury by industry professionals. Pre-submit a jury photo and/or artist statement for feedback from panel members. Learn how to design a booth display. Engage in customer sales role play – learn how to close the sale! Actively work on your Artist Statement with same-day guidance and feedback. Working lunch – box lunch and snacks included with registration fee. As the Daystall and Arts Program Manager at Pike Place Market David Dickinson is deeply engaged with the Pacific Northwest Art Community. The Pike Place Market crafts market began more than 40 years ago and now represents 225 local and regional craftspeople. 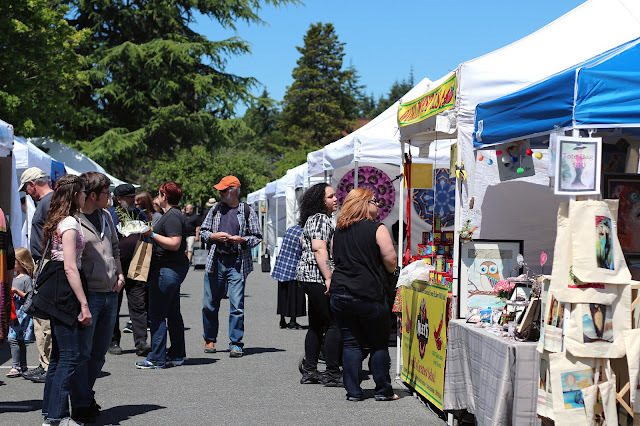 Jessie Hammer is the Coordinator of the Phinney Neighborhood Association’s Winter Festival and Crafts Fair, a fundraising event now in its 38th year that annually hosts 120 juried artists and crafters and draws up to 5,000 attendees. Prior to that, Jessie worked as events coordinator for Apulent Catering in Ballard and was responsible for coordinating an average of 150+ events/year. She has a degree in journalism from Western Washington University. As the Executive Director of the Shoreline-LFP Arts Council, part of Lorie Hoffman’s responsibilities include organizing the Shoreline Arts Festival. She works on the big picture balancing artists, musicians, food vendors, sponsors, and community activities. Nancy Whittaker is the Board Chair of the Northwest Art Alliance which produces the Best of the Northwest and Art in the Park. She is also the owner of the Museo Art Gallery showcasing contemporary art and fine crafts on Whidbey Island. Co-founder of McCrain Photography, Jody McCrain has been involved with the art festival world for the past nine years. She and her husband, Phil McCrain, have participated in many local and regional festivals throughout the Northwest. She has also served as co-director of the Shoreline Artists’ Market for the past six years (last five with Sella Rush). She is a member of the Northwest Art Alliance (Best of the Northwest) Board, and she recently accepted the position of Artist Selection and Jury Pool Coordinator. Having experienced festivals from both the artist and business side, Jody is excited to share with other artists the highs and lows of this journey. Shoreline-based jewelry artist Sella Rush (of Shi-Shi Design) has been selling her handmade pieces in the Pacific NW for eight years. During that time, she’s been accepted, wait-listed, and–shockingly–rejected for festivals and markets throughout the area. Sella has also served as co-coordinator (with Jody McCrain) of the Shoreline Arts Festival’s Artist Marketplace for the past five years. As an active artist and festival organizer, Sella is very happy to share with her fellow artists the lessons she’s learned on both sides of the glass. Art/Business Workshops are brought to you by the Shoreline-Lake Forest Park Arts Council, a 501(c)(3) nonprofit organization whose mission is to cultivate creativity and inspire our community through the arts.